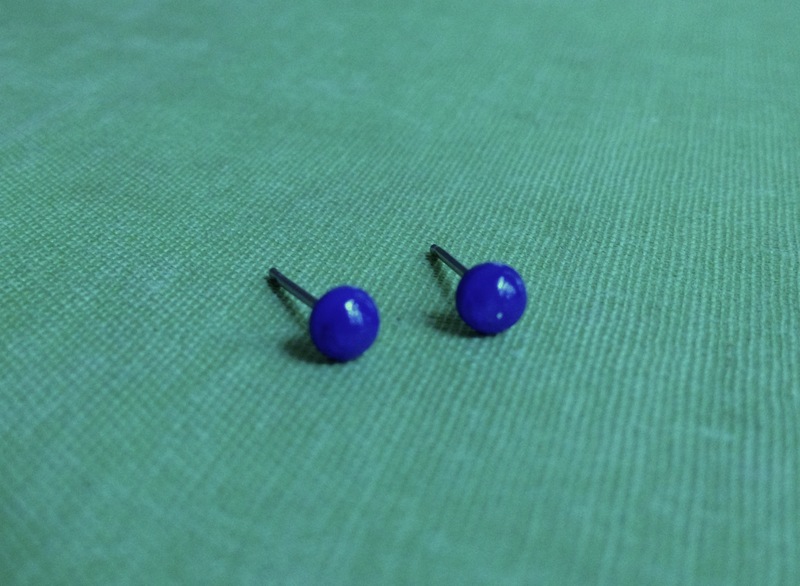 I wear solid-color stud earrings almost every day, changing to fit my outfits or complement statement earrings. 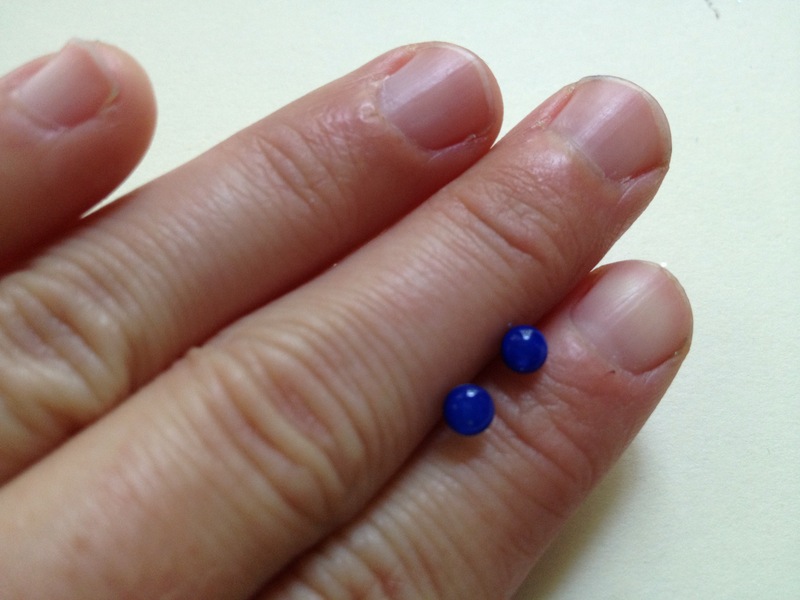 I’ve been enamored of tiny earrings since I was a little girl endlessly spinning the displays at stores like Claire’s, and used to buy my multicolored sets of studs at Forever 21. I decided to spend a little more money and invest in some well-made jewelry from DA Metals in Providence, RI. They are silver and resin, and do not chip! It was worth my investment. I got 5 pairs to go with all my outfits. 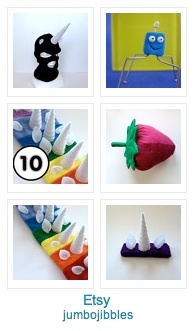 Want to make a pair in every color of the rainbow? 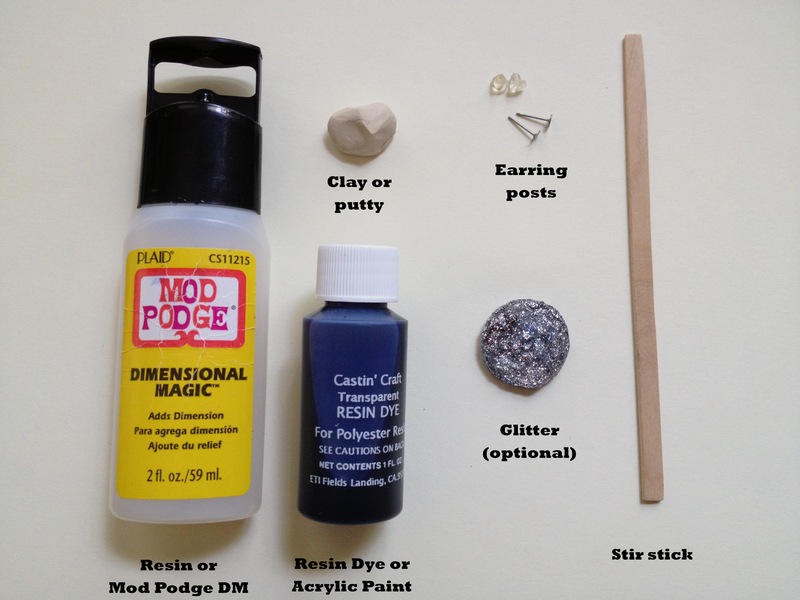 For the price of a bottle of Mod Podge Dimensional Magic, you can make one hundred pairs of studs. They aren’t as sturdy as those made by DA Metals (seriously, get yourself a pair) but you can get creative and add whatever you want. All it takes are some very simple and inexpensive materials. You’re basically mixing up some resin with some color*. There should be more resin than color, but just mix a little at a time. The desired consistency should be water-drop-like: if you put a drop of your mixture on the top of your post, will it stand up like a water drop? That’s good. Carefully dip the earring post into the mixture. I used a pair of pliers to avoid getting resin on my fingers. It’s ok if you get resin on the backside of the post– that will give you a more stable piece and present the resin from falling off when dry. Dip just once, then carefully hang the earring post-down. I stuck a little piece of clay on the edge of my table, but you can also use double-sticky tape. Make sure you put these in a place you won’t be reaching through! They don’t look like much at first, but since this tutorial is not about resin molding, you have to slowly build up the resin in steps. Let the studs dry for a day– don’t touch them! The resin will become hard, but it needs a dry sunny place, and lacking that at least 24 hours to cure. Once hardened, mix another small batch of your color and dip again. Dry as usual. 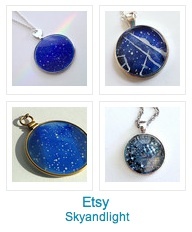 You can experiment with using a base color and covering it in an uncolored layer of resin, or adding a middle layer of glitter. If you’ve got the time and patience you can make these very thick/long. *Only mix up a few drops! This mixture won’t keep, and you’ll need to make it again to finish the project in 24 hours. If you try it, please post a link in the comments! I’d love to see what other people come up with. Now behold some of my favorite stud earrings! Can’t wait to try this! I’ve been scouring the web thinking there must be DIY instructions somewhere. Thanks for posting!